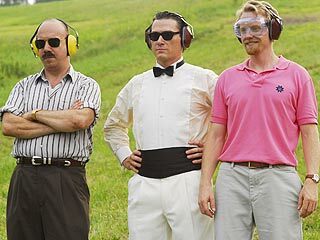 Pretty Bird (2008) is a comedy based on Paul Brown’s novel The Rocketbelt Caper: A True Tale of Invention, Obsession and Murder. It was filmed in New Jersey in August 2007 and premiered at the Sundance Film Festival in 2008, where it was nominated for the Grand Jury Prize. 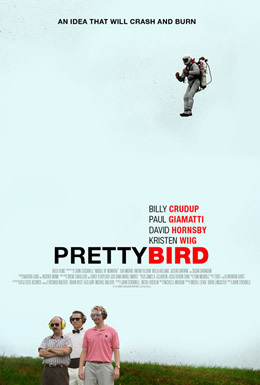 Pretty Bird was released on DVD on June 29, 2010. Curtis Prentiss (Billy Crudup) is the archetypal American dreamer: the rainmaker. He arrives in town with big ideas, a fervent sales pitch, and a set of blueprints in hand. Curtis also has a wealthy old acquaintance who’s susceptible to his incantations. He finds, by chance, an out-of-work aerospace engineer (Paul Giamatti), whom he recruits with a vision of building “the rocket belt,” a personalized flying machine. They embark on their mutual missions—to raise capital and solve the conundrum of flight—but their relationship quickly deteriorates. When unexpectedly they find success, everything really goes out of control, and a struggle begins that will change their lives.